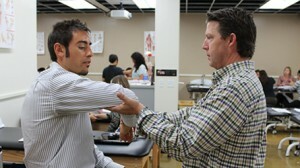 Mitchell Rauh, PT, PhD, MPH, FACSM, is a professor and the director of the SDSU Doctor of Physical Therapy Program. Dr. Rauh’s research interests range from running injuries in high school populations to orthopedics to TBI injuries in the US military. As Director of the new DPT program, he seeks to attract the brightest students and faculty to this exciting doctoral program. See Dr. Mitchell Rauh’s profile page.